Our mission at MAKE’ N THE CUT Barber College, is to provide every student with superior education that is cost effective, which facilitates practical and technical skills in a timely professional manner. Furthermore, we strive to prepare our students to be eligible for the State Barber Exam, with the hopes of becoming licensed barbers with successful futures. 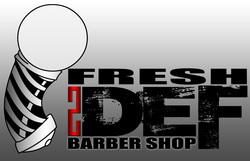 Click: Above Pic for Fresh2Def Barber Shop Link.